The colonization of Altea is well underway, and as any colonist can tell you building a utopian society takes more than physical labor, it takes leadership. Soon that leadership will be decided by the colonists themselves by way of elections. Do YOU have what it takes to lead your Empire to greatness? 2. Be one of the two highest level chars in the empire. Getting nominated does not instantly get you into office of course. You will have to win over your constituents to earn their votes. Will you promise to expand the Empire aggressively? Increase the empire’s resources? Can you prove that you have the wisdom to know who your allies really are? All Empires will have nominations on the day these features go live so you may want to start campaigning now. How often will elections be held? That’s up to the winning leader to decide! It can be every month, every week, or never again. Keep in mind however; a ruler who does not keep their people happy can end up very, very alone. 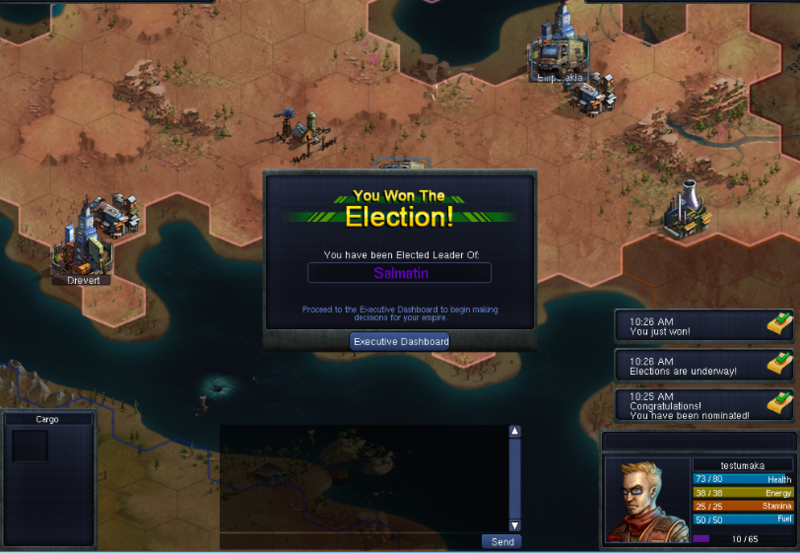 Only colonists over level 20 can participate in voting. How will we know when it’s time to nominate or vote? You will get a notification on the right hand side of your screen when you log into Empire & State. How long is the voting period? What happens if a leader immigrates to another Empire? An automatic nomination period for a new leader will begin. What if a leader is banned? When can we expect to see these features in game? Stand proud Colonists and welcome in a new era for Altea! Colonists, you can discuss this article here. We are a team of 20 or so dedicated to the development of Empire & State. We are excited to share some of our ideas with the community and always welcome your comments and ideas.